While those words are an accurate description of what passion is, the experience of being passionate tells us that that definition, or any lingual definition, just isn’t strong enough. Passion is a feeling, something we can’t express with words or thoughts and something that cannot be contained, controlled, or created—it’s just there. Passion is an absolutely intoxicating feeling that pulls you toward it at all costs. As humans, our natural state is to feel passionately about a lot of different elements in our lives— friendships, lovers, aspirations, jobs, goals, maybe even just about life itself! Unfortunately, as tantalizing and intoxicating as it is, passion is often suppressed and squandered by the same things that elicit that feeling to begin with. When the monotony of the daily push toward life goals or the stress of job or the second fight you had this week with your best friend gets in the way, the passion that you felt can be swept under the rug. If we're not careful, we can start to stray from our passion-path. Luckily, the sense that is most closely tied to memory and emotion—smell—can come to the rescue here! 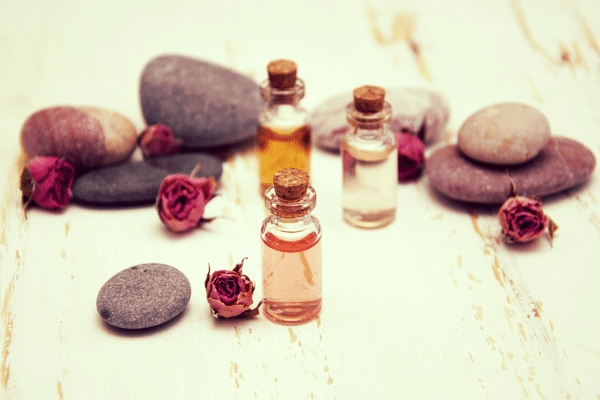 Using essential oils to rid yourself of stress and reconnect with the passionate part of your soul can be really soothing and empowering for you. And let’s be real here, a passionate lover. That’s what we’re here to talk about. Frankincense is a calming and uplifting fragrance that connects to the sixth chakra. It helps the mind connect to its inner vision and allows for intellectual understanding of the personal consciousness. The very special tree resin breaks down barriers to let the mind channel the energy that gets stuck on stresses and anxieties into finding creative solutions. Frankincense also has the unique ability to allow the body to awaken sensually.By allowing yourself to awaken in this way, you will be able let go of pent-up energy and have an easier time releasing the worries that can get in the way of your passion. This is another essential oil made from a tree resin. It was once used in ancient temple rituals as incense, placed on burning charcoal. The scent was used in meditation because it helps to open a channel to a person's essence. Sweet Myrrh releases the ego and lets the soul walk along the path offered by the universe—the passion path! The essential oil diluted in coconut oil is wonderful for massage. Its sweet, earthy scent is strong and lingering, making it a beautiful base note in many perfumes. This light, floral scent is cool and refreshing as a mist for times of stress, but it can help you create some serious heat when you need to share a tender moment. Indeed, neroli is commonly used sensually because it’s empowering. It is known to help elicit desire and romance in people who just aren’t feeling the passion anymore. Ooh la la! Add some neroli essential oil to water and use it as a spray for your linens and pillow before bed. Our Neroli Toning Mist is a great way to keep some neroli on hand anytime you need a lift! Ylang-ylang, which means “flowers of flowers,” has the very lovely ability to move energy. It’s soothing and calming to the mind while increasing your sensual side, especially when it comes to everyday stressors that can impact your desire. Used in aromatherapy, ylang-ylang increases personal connection to the type of love and care that someone needs so it’s a great choice for the diffuser on date night or after a hard work week. Although it was popularized during the free loving hippy movement of the 1960s, patchouli actually has a much longer history of inspiring passion. It is known to have been used in aromatherapy during tantric ceremonies in India long ago. That ancient connection seems to have continued throughout time. This scent is so well-known to us, yet there have been no successful attempts to synthesize it. The deep, earthy, musty smell is typically used as a base note in perfumes that create desire. Do you have a favorite essential oil for inciting your passion? Let us know in the comments below! I am grateful for all you have done to help us learn a better way to take care of our bodies. I just wanted to point out that for many followers of Jesus that we don’t buy into worshipping the the universe or ourselves. I have repented of my prejudice against buying from good companies like yours just because we don’t agree spiritually. Thank you for all your hard work and dedication, to me you are a God send. I love your articles, Aubrey!